Qingdao Movie Metropolis, a mega movie industrial center, made its debut Saturday in China's Qingdao, Shandong province, in an effort to bolster the domestic film industry and become China's Hollywood. 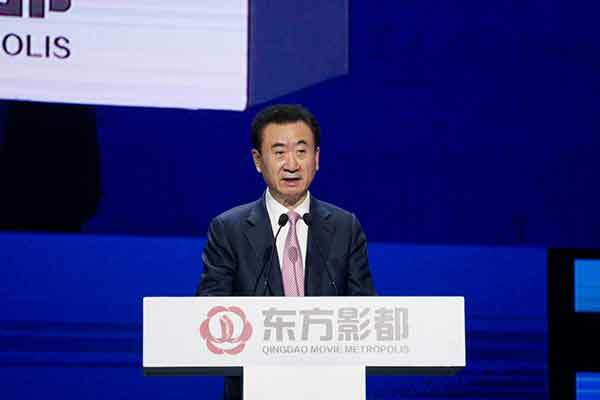 Wang Jianlin, the project's major initiator and head of the Chinese conglomerate Dalian Wanda Group Co Ltd, said that it aims to build the movie metropolis into a "new global hub for films". "The establishment of the movie metropolis is a milestone for the industrialization of the Chinese film industry. It will help promote Chinese films to go to the world stage," said Wang. With an investment of 50 billion yuan ($7.9 billion), the metropolis covers an area equivalent to more than 200 football fields. The vast complex includes 52 high-tech studios and features a shopping mall, school, hospital, luxury hotel and other amusement facilities. Another 5 billion yuan of investment will also be put in to support the development of the movie industry of the metropolis. Film works entering the metropolis will receive 20 to 40 percent of production fees as subsidies.